I thought my first blog would just be a little “get to know me,” a little look into my life. I am a full time “Jack of all Trades.” I am a housemaid, changer of diapers and official boo-boo kisser, an amateur chef, and a master of sarcasm. I’m also an employee at a local Extension Office, a 4-H volunteer, and a lover of animals, and a proud inhabitant of the Oklahoma Panhandle. I have a passion for agriculture and educating others about the industry that sustains not only my livelihood, but also the lives of the entire world. I grew up loving all things princess- aspiring to be a princess, (what little girl hasn’t at some point in her life) hence the name of my blog. My fairytale begins long before this point, but for the sake of time (and honestly, this isn’t an obituary) we will start where I met my “Prince” so to speak. (We never speak to each other that way- I almost cringe calling him that.) I met my husband, Nick as a freshman in college. He would tell you that I was a hard one to catch; but I would counter that there was an equal amount of cat and mouse games for both parties there for a while. Eventually fate would take its course and I would become the wife of a farmer on August 3, 2013. Before you get any ideas, I am not a city to country transplant. While my family did not farm, we were what I would consider a rural family. The town I grew up had around 300 inhabitants, with the only businesses being a gas station, a co-op, and a CPA Office. I grew up in FFA and the “Friday night lights” of the school’s basketball gym. I showed sheep, was active in all of my school’s extracurricular activities at one point or another (what few they had), and took great pride in being a “country kid” like small town kids generally do. 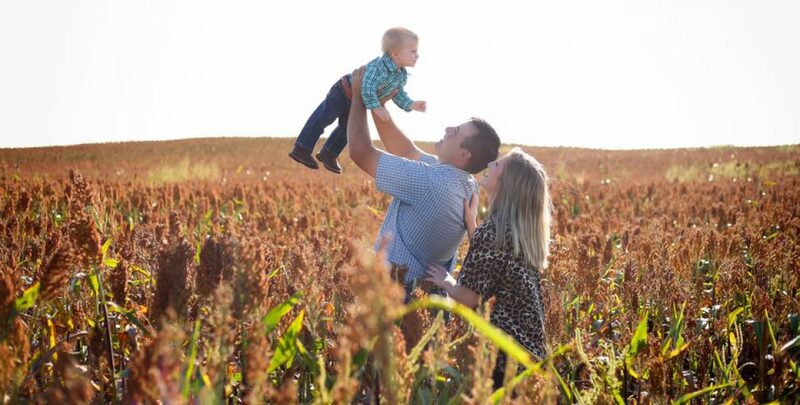 I had a rather basic understanding of farming and what it took for those guys to make a living, but being married into a true “farming family”has opened my eyes to so many realities today’s farm and ranch families are facing that many people not directly involved in the industry will never fully know. This blog will give you a first hand account of our daily lives. Struggles, successes, and everything in between. Stay tuned! Aside from being married to my farmer, we introduced our sweet, ornery boy in the world on October 2nd, 2015, (14 days past his due date, I might add.) He was late arriving, and I have been late to literally everything since. Gage is the light to our lives, and already growing to love the “tombine,” ‘tratee,” “doney,” “tows,” “seeps,” and “boppies” (combine, tractor, donkey, cows, sheep, and puppies). Mama and Daddy couldn’t be more proud. As a college student I worked as a scale operator, grain inspector (It’s really not as cool as it sounds), paper filer, basement cleaner, and “anything else that needs done person” at a local coop. While that was not my first job, that was the first job that I can say I really started to get a real glance into everything it takes to make a farm work. I watched farmers stand there in awe and frustration as they found out fertilizer or chemical prices had risen so high or as they watched the grain markets plummet. I took phone calls from landowners in California wanting to sell their grain- to find out they had about half as much to sell as they did last year due to crippling drought. I even watched as some farmers had to sell out. The cost of production was just far more than what they were making at the end. It was the first job I had that gave me an education to go along with the education I was paying for. Although it wasn’t always rainbows, and I wasn’t always a fan of all my co-workers, I built some great bonds with some great people, and learned so, so much. From there I took a job with a local extension office. Working with an office of only women was a little intimidating to me at first, I know how women can be, ya know. But this job has been a whole new education. I am the secretary- by no means a specialist or an agent, but I love my job. In the past two years I’ve learned even more about agriculture research, everything extension has to offer, as well as 4-H- which I have developed an even deeper passion for than I had before- who knew that could happen?! Hopefully through some of my posts, you will get an idea of just how great Extension and 4-H truly are. My blog will be a direct view through my eyes of life in the ‘handle. Some days will be just a run-down of our day-good or bad, sometimes it’ll be a recipe, other days it will be an opinion or something I feel strongly about. This blog will be a way for you to get to know me- and to live my “Rural Life Fairytale” right along with me.